bitter sweet stamping: Sharing my spark! This card turned out great! I love how you made the lamp look like it's on. Cute! Hello Tisha. My name is Tisha as well. I never seem to find people with the same name as me. I just stumbled on your blog, and love your cards, definitely the style I go for as well. Have a great day! 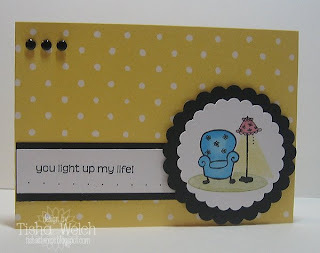 very cute--how could you go wrong with one of the new yellow note cards and "light" as your inspiration!! Cute! Love how the black makes everything POP!